Montel Jackson talks with MyMMANews.com about a number of topics, including his upcoming bantamweight fight with Andre Soukhamthath at UFC 236. The event takes place on Apr. 13 at State Farm Arena in Atlanta, Georgia. “Quick” talks about what the last year has been like for him — from appearing on Dana White’s Tuesday Night Contender Series last summer to preparing for his third Octagon appearance — what he learned from his UFC debut decision loss to Ricky Simon and how that can be a lesson to up and coming fighters in the sport, his submission win over Brian Kelleher at UFC 232, his relaxed nature about fighting and where it comes from, his reaction to being booked against Andre Soukhamthath at UFC 236, why he doesn’t call fighters out, his prediction for the fight and much more. Jackson also talks about the state of MMA media and what he will change about doing interviews once he becomes a star in the sport, as well as his thoughts about sponsorship opportunities in mixed martial arts. 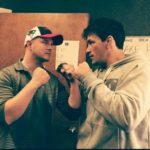 Honestly, if you are someone who is looking to make a name for yourself in the sport, or the MMA media realm, this is an interview that you should listen to. There’s not many who view the sport quite like Montel Jackson. UFC 236 will feature, for the first time in UFC history, two interim title fights on the same card. In the main event, Dustin Poirier will take on the current featherweight champion Max Holloway for the UFC interim lightweight title, while Kelvin Gastelum will take on the surging Israel Adesanya for the interim middleweight title.